Free Blown Covered Canister with applied blue rings and berry on the cover knob. Clear brilliant glass. Excellent condition with 1 small flake on outer edge of lower blue ring. American origin, probably Midwestern. 11″ tall, 5 3/8″ diameter. 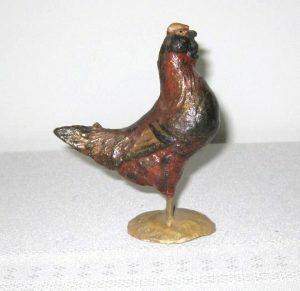 Smaller composition material chicken with nice original paint. Excellent condition. 3 3/4″ high. 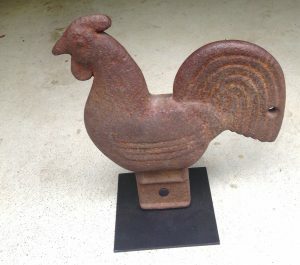 An excellent example of the Elgin “Rainbow Tail” Rooster windmill weight, approximately 60 lbs. It is 17 3/4″ tall and 16″ long. The surface is excellent original old hard, dark rust (never painted). The physical condition of the casting is also original and excellent. Made by the Elgin Wind, Power an Pump Co., Elgin, IL, c/ 1890-1920. Mounted on a custom base. 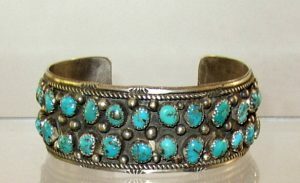 Navajo sterling cuff with 38 turquoise nuggets. 5 7/8″ around inside with a 1 1/4″ opening. 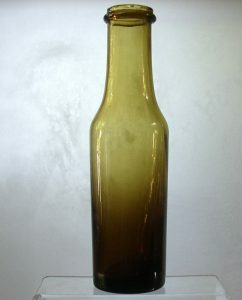 An excellent example of the G111-16 pint size blown 3-mold decanter, c. 1815-1830. The color is anice deep olive amber. The pattern impression is sharp and crisp anad the mouth has a desireable flared lip. 7 3/16″ high. The condition is mint. The glass is clear and brilliant with no damage. This pattern is generally attributed to the Keene, NH, Marlborough St Glass House. 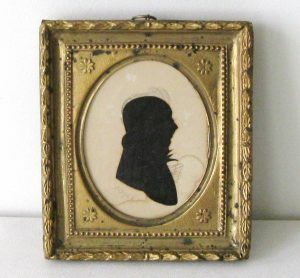 Hollow cut American silhouette of a gentleman, signed “Doyle” for William M. Doyle, Boston, MA. Doyle was an early silhouette artist and died in 1828. The hollow cut artwork is embellished with pencil/graphite hair and collar. It is laid over its original black woven fabric, c. 1815 or so. Cutting is in excellent condition, as is the fabric. Minor water mark in the lower right. 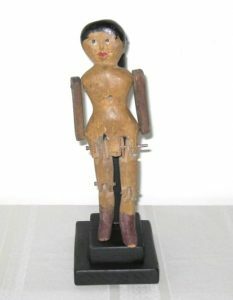 Somewhat crude but charming carved wood and paint decorated articulated female doll, 9″ tall. Probably made in the early 20th C. Nice condition. Mounted on a simple stand for display, but not glued and is easily detached. 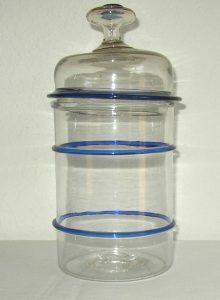 Blown honey amber food/storage jar with applied collar lip and heavy base giving it a graduated color appearance, light to dark, top to bottom. Clear brilliant glass with nice swirls and waves in the glass. 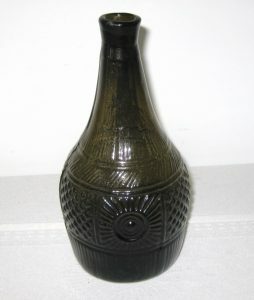 11 3/8″ tall by 3 1/8″ diameter. Smooth base. Nice condition with only a small flat flake (about 1/8″) on the outside of the rim. Probably French origin. 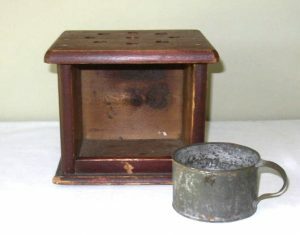 Nice 19th C. wood foot warmer with its original red paint and tin cup for the hot embers. Excellent original condition. Square nail construction. 9″ wide and 7 1/2 tall.